In biology, indicator species are used to determine the health of a given ecological region, with their presence (or absence) indicating either good or poor conditions. Women are considered an “indicator species” for bike-friendly cities for several reasons. First, studies across disciplines as disparate as criminology and child ­rearing have shown that women are more averse to risk than men. In the cycling arena, that risk aversion translates into increased demand for safe bike infrastructure as a prerequisite for riding. Women also do most of the child care and household shopping, which means these bike routes need to be organized around practical urban destinations to make a difference. While some female cyclists object to being referred to as an indicator species, I see it as an opportunity. Here’s the thing. I am that indicator species, part of the demographic being catered to by bicycle advocacy groups. Not only am I a female cyclist, I am a parent. 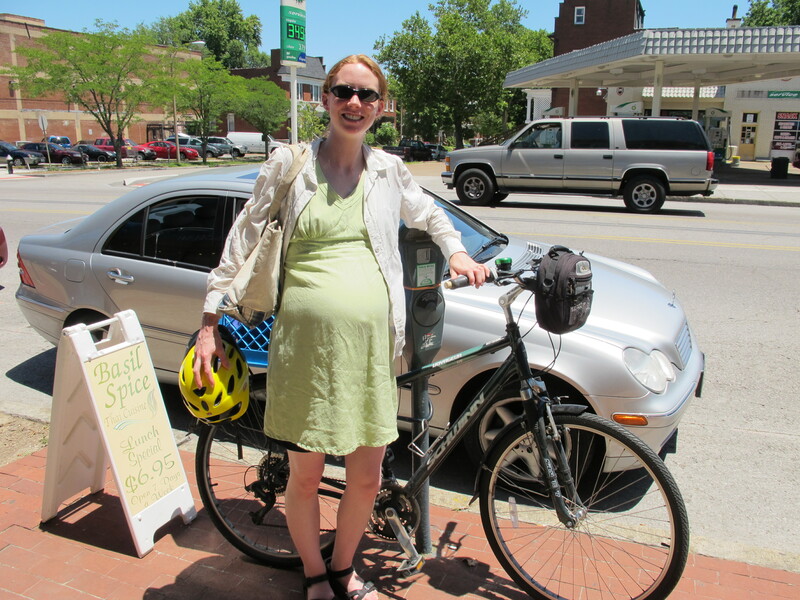 I cycled throughout my pregnancy . . .
. . . and I regularly use a bicycle for trips with my son. Perhaps that qualifies me as not just an indicator, but as an über-indicator. And this member of the indicator species is very frustrated. I’m frustrated with bike advocates and planners who continue to implement dangerous-by-design bicycle “improvements” that marginalize cyclists and contribute to the myth that cyclists and motorists belong in separate spaces, when the spaces for cyclists (be it bike lane, buffered bike lane, or cycle track) invariably increase crash risk at intersections — the place where cyclists are in the most danger of car-bike collisions. I am a member of the indicator species, and I object! Bike/ped organizations are assuming that the paint will lure new bicycle commuters, thus increasing their “counts,” while taking for granted that the cyclists who have already been riding, who are already committed to this form of transportation, who have been educated about how to safely coexist with traffic . . . that these cyclists will continue riding, despite roadway “solutions” that actually make things MORE dangerous for cyclists. Maybe we will, but maybe we won’t. Maybe you will make the roads so unpleasant, so littered with dangerous paint, that we will throw in our hats. We, who have been the face of cycling for years, we, who are even now encouraging others to try bike commuting for the first time, we, who support your bottom line goals of getting more people on bicycles, just not the way you are going about it. Portland, OR, May 2012 — Cyclist dies after being right-hooked by a tractor trailer while riding in a bike lane downtown. It’s worth scrolling down and looking at the intersection pictures. Copenhagen, September 28, 2013 — Cyclist dies after being right-hooked by a bus while riding in a cycle track. These are but two examples (of far too many), both from supposed “meccas” of bicycling. All the special paint or buffers in the world cannot change the fact that the safest place for a cyclist to operate is in the lane as part of traffic. Now, I understand that this is an uncomfortable place for many cyclists to ride (though hardly more uncomfortable than either of the bike lanes pictured below). I know the surveys and polls show that you will get more cyclists on the streets if you install bike lanes (or other facilities). This is great in terms of sheer numbers, and more cyclists on the roads makes everything safer for other cyclists, attracts more cyclists, etc. However, bikes lanes (buffered or not) are basically a gauntlet of potential dangers, even for an experienced, educated cyclist. By installing more bike lanes to attract newbie/novice bicyclists, cities across the country are creating dangerous places (made more dangerous by the [false] perception of safety) for the most inexperienced riders out there. I think it’s important to note where I come from, because I did not always hold my current views. I, like many other cycling advocates and city leaders and planners across the country, saw a compelling case for bike lanes in terms of increasing cycling numbers. In April/June 2011, I took CyclingSavvy. Thankfully, I was open-minded enough to hear and process the information in the course and conclude that some of my previously held beliefs were simply incorrect. It is a shame that others refuse to attend the class outright, or attend with closed minds, going back to their jobs, or their soapboxes, and maintaining the status quo — directly or indirectly promoting a culture of fear, vulnerability, and separation. So what’s the answer? Are all “bike facilities” bad? The short answer is “no.” The long answer? Regarding the types of on-road bike facilities listed above [bike lanes, buffered bike lanes, and cycle tracks], I selected “I prefer no facility” because I feel/would feel very uncomfortable using any of the bike facilities (I have ridden in a cycle track in Washington, DC). While cycle tracks offer some level of protection from being side-swiped, they present the same dangers at intersections and driveways as bike lanes, perhaps worse due to poor visibility caused by parked cars, less relevance to motorists, and the increased perception of safety that leaves cyclists exposed to the dangers of collisions at intersections, already the place where most car-bike collisions occur. The most recent cyclist death in Copenhagen (not to mention quite a few right-hook deaths in U.S. cities over the past 2-3 years) clearly illustrates the problem with facilities such as bike lanes and cycle tracks. I strongly encourage GRG and the City of St. Louis to focus on solutions that include sharrows and signage (including “Bikes May Use Full Lane and way-finding for cyclists), neighborhood greenways (i.e., convenient routes for cyclists that minimize stop signs and utilize other traffic-calming measures including speed humps and streets that are limited-access for motorists), as well as supporting and promoting high-quality, comprehensive bicycle education programs. In my experience, many roadways have plenty of capacity for motorists and cyclists to co-exist, IF the cyclists are well-educated in operating their bicycle as part of traffic. The good news is that there are ways we can spend money, there are improvements we can make, on both infrastructure and education, that will encourage more people (including other members of the indicator species) to use bicycles without compromising safety. I enjoyed your post. I am doing a project called Rest Stop Bike Repair Shop. I, too am a cyclist and raised 2 children. My children are now 30 (no drivers’ licenses) and I am still a car free cyclist. My project considers the roadway as a gendered space. ps – if you want to engage in my project with your voice, call 716-320-0522. Thanks so much for this post! I couldn’t have said it better myself! Dumb. Look at the national safety statistics of denmark. Big difference. BlocBizz — I welcome other opinions here, but I prefer that they be expressed thoughtfully and cordially. Simply calling something “dumb” does not meet these criteria, nor does it add anything to this discussion. If you have specific studies/statistics on Denmark with sources, please feel free to provide more information and/or links. Without more specifics, one statistic that stands out to me is the seven Copenhagen (Denmark) cyclists who died in the first nine months of 2013. Compared to the most recent numbers I found for the U.S. (2011), that gives Denmark a significantly higher per capita cyclist death rate than the U.S.
Great response, Melissa, and great article, too! I resent, as a female cyclist, being used to justify various capital “improvements”. Riding close to 10,000 miles annually, I feel safest when riding as a vehicular cyclist. Like any cyclist, male or female, it takes time to become comfortable riding as regular traffic, but not that much time. Given the very simplistic statistic, I feel compelled to copy this quote here. In my opinion, the data conclusively shows that cycling in the US is SIGNIFICANTLY more dangerous than Copenhagen and other parts of Europe. One of my main issues with comparisons to the Netherlands is that often, their lower fatality rates are attributed solely, or at least mostly, to infrastructure, when education about cycling (for ALL road users) and cultural expectations, as well as things like higher fuel taxes that disincentivize motoring, play an equally important role. I won’t say that cycle paths are sole reason for incredible safety statistics in the Netherlands as there is obviously a multitude of factors. But I have a difficult time believing that education plays much more than a minor contributing role. Many of the newest cities and neighborhoods in the Netherlands have worked hard to segregate different modes of transportation so that they interact as infrequently as possible; and when cyclists and cars must be on the same pavement, the road usually has a speed limit no greater than 20mph, a marked difference from the US and STL where we put “Share the road” signs on 35 and 40mph highways such as Lindbergh, Olive, and Manchester and call it a day. Just to make my opinion known, I’d love to see STL emulate the bicycle design standards found in the Netherlands and Denmark. It’s a shame nobody here seems to know how. BlocBizz says: “Dumb” and “BS.” You might elaborate on these, if you want your readers to take you seriously. Melissa, you make some amazing points, here, and it’s good food for thought. As a newly-returned-to-it cyclist, one who is just starting to explore cycling as transport, a slow-poke on two wheels, and someone who cycles primarily in St. Louis County (“we’re for cars”), I feel much safer in a designated bike lane, so I’m probably precisely the sort of indicator species they are aiming for. I absolutely see the shortcomings you point out, though. I think some of the comments in the articles you linked to raise some key issues – timing cycle lights so cycles can move out of the way before vehicles would turn, getting large trucks out of city centers, better blind-spot mirrors, better training for drivers, and slower vehicle speeds on multi-user routes would all address the same concerns, with or without designated lanes. Thanks for this. Definitely a lot to think about. Rebecca, thanks for your thoughtful comments. I was actually thinking of you (and other cyclists like you), and wondering about your response, when I wrote this post. I definitely want this to be a space where we can discuss varying approaches. Also, I’m not sure when it will happen, but I really would love to ride your commute route with you sometime. Absolutely! Perhaps we can brainstorm a good option for the Clayton Road leg. I am so much slower than traffic, which is easier in the AM than in PM rush. I just don’t feel safe, especially when the sun is in everyone’s eyes! I think the key to understanding these facilities is that the designers don’t believe bicycles can be used for transportation. Several have told me they are afraid to ride in traffic lanes, and only one has admitted to riding more than 3-4 miles in traffic. Their lanes ARE safe if you only ride 5-6 mph. I (and I suspect you) would consider this useless – it’s practical to bicycle 30 min instead of driving 20-25 min; nobody would bicycle if it took 90 min. The local bike lanes are usually installed in congested urban areas where there are already lots of bicyclists that motorists want to remove from traffic. In more rural or suburban locations where bike lanes might help, they are rarely installed because there are not enough bicyclists to justify them. 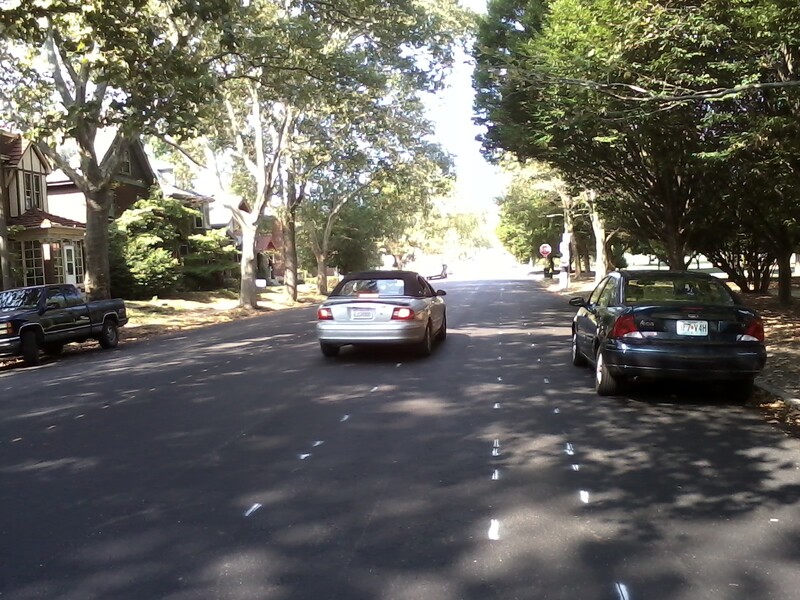 In short the bike lanes are typically installed where they cause bicyclists the most problems. BlocBizz, a key factor influencing the safety statistics in Denmark (and the Netherlands and Japan) is that motorists are punished for hitting bicyclists and pedestrians. This is unheard of for sober motorists in the US. I will agree that sharrows may be BS – the ones I saw in Baltimore ranged from the door zone to half way underneath parked cars. Facilities designed by motorists (including bike lanes and cycle tracks) don’t help bicyclists if motorists know they will never be faulted in collisions. Brilliant, as an example of the species hated by bicycle advocates, middle aged, male, rides a road bike, its fantastic to hear your point of view. I used to be very much a “take the lane” type of person, and I still am. I am an LCI and have taken similar classes to CycleSavvy. I didn’t ever understand the “need” for cycle tracks or buffeted bike lanes UNTIL I took my 4-year-old on a ride that I do all the time and it terrified me. I realized that this is what it feels like for an inexperienced or less confident rider. There is no way that I would take my son on a road where we need to “take the lane.” We actually rode on the sidewalk for part of this little 3 mile stretch, a cardinal sin in my mind. I still ride with him on the street but we are limited in the areas we can go when he is on his own bike. Of course, the obvious answer is to slow vehicles WAY down, 25mph max, educate drivers properly, and impose real punishments for pedestrian and bicyclist injuries/death. I’ll take that as a solution instead of cycle tracks. However, I’d also take the cycle tracks as well and enjoy the heck out of them. Elle, thanks for weighing in. I’m working on a post that will highlight some of the comments here and allow me to share some thoughts in a coordinated, all-in-on-place fashion, rather than just in comment replies, and I would like to include your voice and your experience riding with your son, as this is not an experience I’ve had yet. Just a small note for readers, the traffic cycling course is CyclingSavvy (I’ve been informed that CycleSavvy is a website about menstruation, which may be perfectly lovely, but is not what we’re discussing here 🙂 ). Happy to help answer questions about our experience! It has certainly been an eye-opener with him on his own bike. I feel that there isn’t just ONE solution to cycling issues. I agree that poorly designed bike lanes/tracks are worse than no infrastructure but I also see that a balance can be obtained. I think cycle tracks are great in some areas and in others, proper lane sharing works just as well. It is always interesting to me when I’m in the lane to see a rider on the sidewalk–I’m always wondering what they’re thinking, why they’re there, and how they feel riding. I also came across this feeling recently when talking with my 13 year old son about riding to his music lessons. The music store is on a main street through town which happens to be a one-way,two-lane US highway, speed limit 30 — perfect road for controlling (either) lane. He only has to go for 3 blocks, but two traffic lights, and it makes the most sense for him to do it in the left lane (he enters from the left side, and the store is on the left side). But his judgement and traffic observation skills are not sufficient that *I* feel comfortable with him doing this. I think he feels ok about it (except that the very next day he crashed on a side street, and is not so keen to bike anywhere right now ;-(. Hmmm… mixed feelings on this post. I totally agree about the bike lanes being dangerous at intersections, I’m just not convinced that taking the lane is much safer, unless you’re on streets without much traffic. But most of the through streets in my area have speed limits of about 45mph and no way for a car to safely pass you if you’re taking the lane. I’m not sure how a cyclist would even get into the lane in the first place since there is just soooo much traffic! Plus, drivers have NO IDEA that taking the lane is a legal thing for a cyclist to do. People yell, and honk, and CatMan has even had people get out of the car and threaten him with tire irons! So I’m curious to know what kind of streets you would feel comfortable riding on with the take the lane approach. I mean, here at least, any street that has 2 lanes in each direction is frightening enough in a car – people go over 60mph even when it says the speed limit is 45…. I simply can’t imagine anyone doing it on a bike! And if you stick to smaller streets you’ll spend your entire life stopping at every corner and waiting to get across the major thoroughfares without a light. So I honestly don’t know what the best solution is. As a result, I’ve pretty much given up the idea of using my bike for transportation. I’ll run errands on my bike in my immediate neighborhood, but if I have to get on or cross a major street of any kind, I just won’t risk it – getting hit once was enough for me. I am fortunate to live in a city with a great greenway/bike path system, and I pretty much stick to that these days, and also just ride for exercise and fun so my destination doesn’t matter much. Many people are able to use that system for commuting – and it works well if downtown is your destination. But the problem is that there’s really only one north/south route along the Platte river, so you end up having to go 10-12 miles out of the way if you want to go north or south in my part of town – not to mention the fact that trying to ride north or south on the west side of Denver requires you to go up and down a series of incredibly steep hills since the entire area is a series of streams and gulches running from the mountains into the Platte river! Meanwhile the city continues to build more and more bike lanes with NO buffers at all – it’s like they want you to ride in the door zone, which just seems crazy to me! And it seems like every few weeks there’s another story on the news about a cyclist getting killed or seriously injured by a car. Anyhow… sorry for the loooong comment, I know I’m rambling without much point here – the entire topic is just incredibly frustrating to me, and at this point I don’t even know what to lobby for! I’m assuming that you are in a more suburban part of your metro-area, and face some of the same problems with big connector roads and poor connectivity/access on the smaller roads that Rebecca faces in suburban St. Louis. Many of the cycling videos used in the CyclingSavvy course were shot on roads in suburban Orlando that are not unlike what you describe. Multiple lanes, relatively high speed limits (which yes, often means even higher actual vehicle speeds), etc. As I mention in my latest post, it does take education, time, and practice to become comfortable with riding on these roads, but it is possible. CyclingSavvy teaches techniques and principles of traffic flow that help cyclists understand how to use these roads, especially for short stretches, to connect smaller, lower-traffic roads. Being able to enter these large roads at signalized intersections is helpful — if you have to ride far out of your way to get a traffic signal to create a break for you to become part of traffic, that can certainly be frustrating and limiting. Given my location in a more urban (though still not particularly dense) part of St. Louis, most of my riding is on multi-lane roads with 35-40MPH speed limits. Because of better connectivity of the small streets, I am able to use somewhat smaller roads for many of my routes (though I sometimes choose the larger roads, which get me where I’m going more efficiently due to having fewer stop signs). Finally, the fact that you are riding your bike for close-by errands within your immediate neighborhood still puts you far ahead of most Americans, so I hope you feel good about what you ARE doing, rather than what you are not doing! @EcoCatLady @Melissa – I DO share a lot of Eco’s frustrations living in the county and almost always eschew major roads for side roads. Unfortunately, because suburban St. Louis (beginning almost immediately with the County boundary) is a hodge-podge of randomly-developed neighborhoods that aren’t on any sort of grid unless you are RIGHT on the city boundary, or in an island bisected from other islands by topography or arterial routes. Therein lies my frustration. At 10MPH, I’m simply not sure I’m interested in riding with rush-hour folks who are frustrated, distracted, and traveling 3-5 times faster than I am. My solution for the .3-.6mi of arterial road I cannot avoid is super-controversial: I take the sidewalk. I have ridden in the street, and I am not a fan. Maybe on a road bike, where 20+mph is a meaningful possibility, but I’m not that keen on going so fast on a bike, at least at this stage of the game. As a result, I, too, am struggling with my commute. I will be very curious to see, if Melissa and I can try the route together sometime, what her opinion is of the route. Honestly, a large part of my issue with my commute, too, is the distance. I find 6-6.5 (depending on route) to be at the upper-end of what makes sense for me. It takes 3x as long to bike it as it does to drive it most days, and I’m not particularly effective at managing my time in the morning, which has forced me to default to the motorized back-up plan more often than I care to admit. We occasionally get semi-serious about moving, and I’ve declared on multiple occasions since last spring that I’d want any relocation to make my life MORE bikeable, rather than less. But I’m not sure what that should mean for me. Do I want to be within 3 miles of my office? Or half a mile from some of the better greenways or trails? Do I want to be able to bike to a few things really consistently? Be able to bike my neighborhood even if I resign myself to driving to work every day? Or try to ditch the car? I’m not sure car-ditching feels like a very meaningful option as long as we’re in St. Louis. Great article still trying to find a CycleSavvy course close enough to me. Keeping my fingers crossed in the meantime I searched out as many videos and internet available publications the CSI’s have posted. I really wish I had a course close to me. Learned so much from just reading and watching videos. Know I could learn even more if I actually took a course. One day I do plan on taking a course. correction to my last comment cycling savvy course. Hi Marc, thanks for reading. What part of the country are you in? CyclingSavvy is growing quickly, so hopefully there will be something near you soon. and are both great resources, but there is definitely no substitute for actually taking the course, a statement that was reinforced by our local CS grads at our “advanced” session over the weekend.